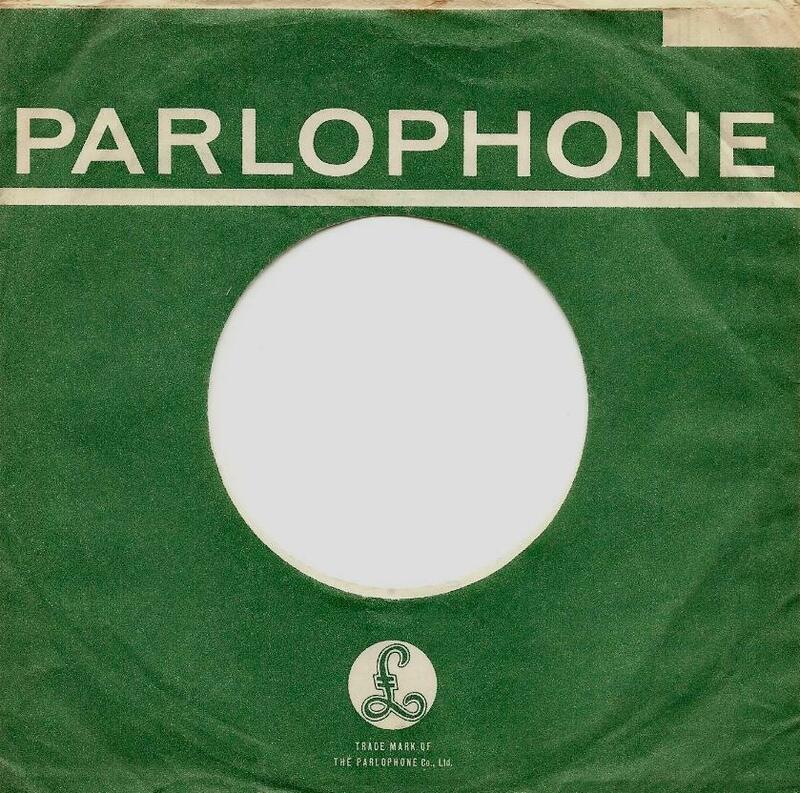 The Beatles Collection » Parlophone company sleeves. Type 1 sleeve. 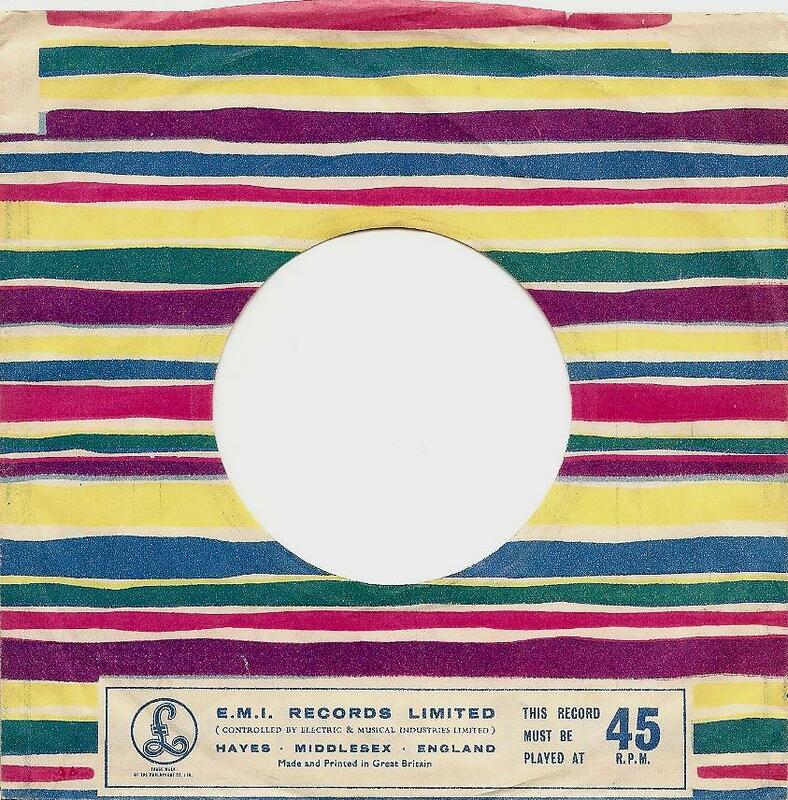 Blue, red, yellow and green multicolored sleeve designed in the late 50s to be used with the red label. 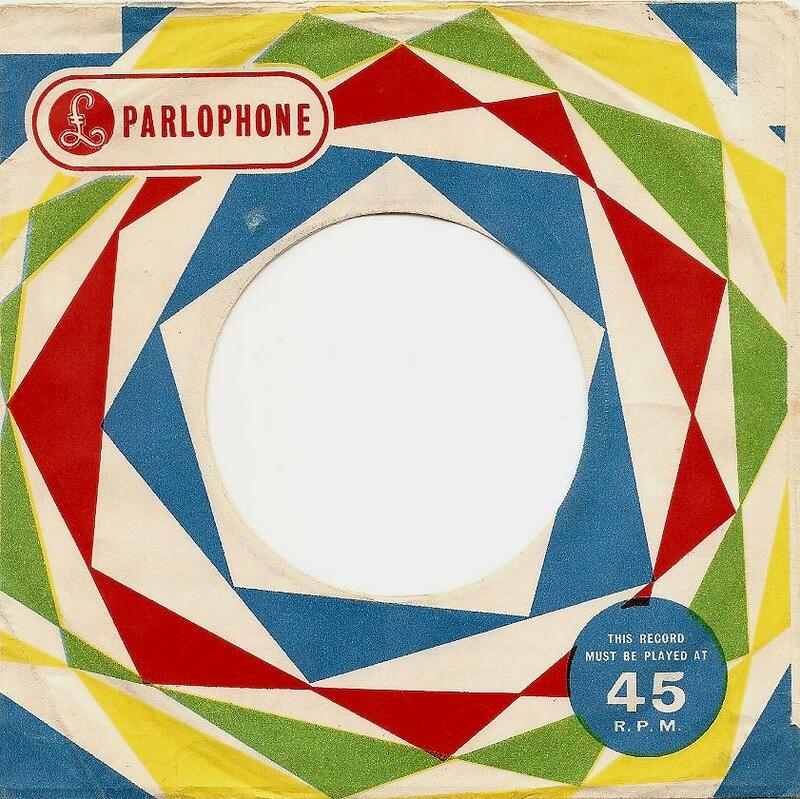 Used from 1958 until 1963 with Parlophone series 45-R 4441 – 45-R 4988 including The Beatles singles 45-R 4949 “Love Me Do” and 45-R 4983 “Please Please Me”. Type 2 sleeve. Multicolored striped sleeve. 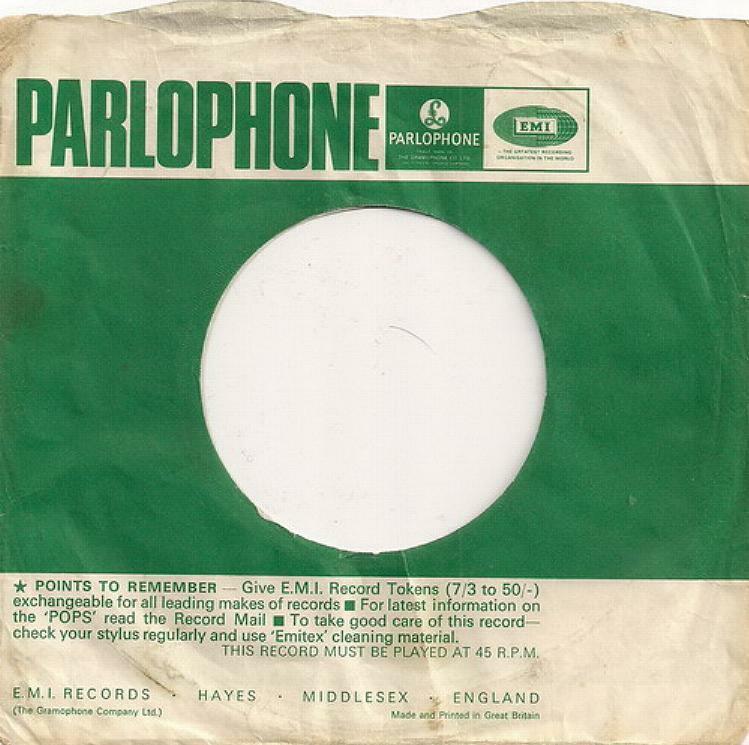 Used during the early 60s until 1963 with with Parlophone series 45-R 4441 – 45-R 4988 including The Beatles singles 45-R 4949 “Love Me Do” and 45-R 4983 “Please Please Me”. 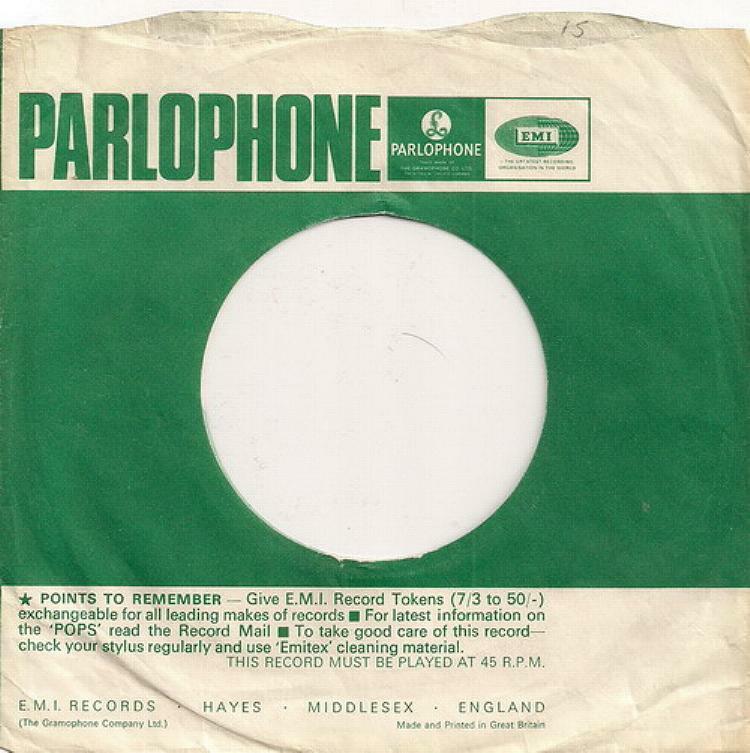 There are some sleeves of Type 2 where the box with the Parlophone logo and the text “THIS RECORD MUST BE PLAYED AT 45 R.P.M.” is missing. Type 3 sleeve. Dark green sleeve with white print and straight top. When Parlophone started with the silver & black labels they also redesigned their company sleeves. 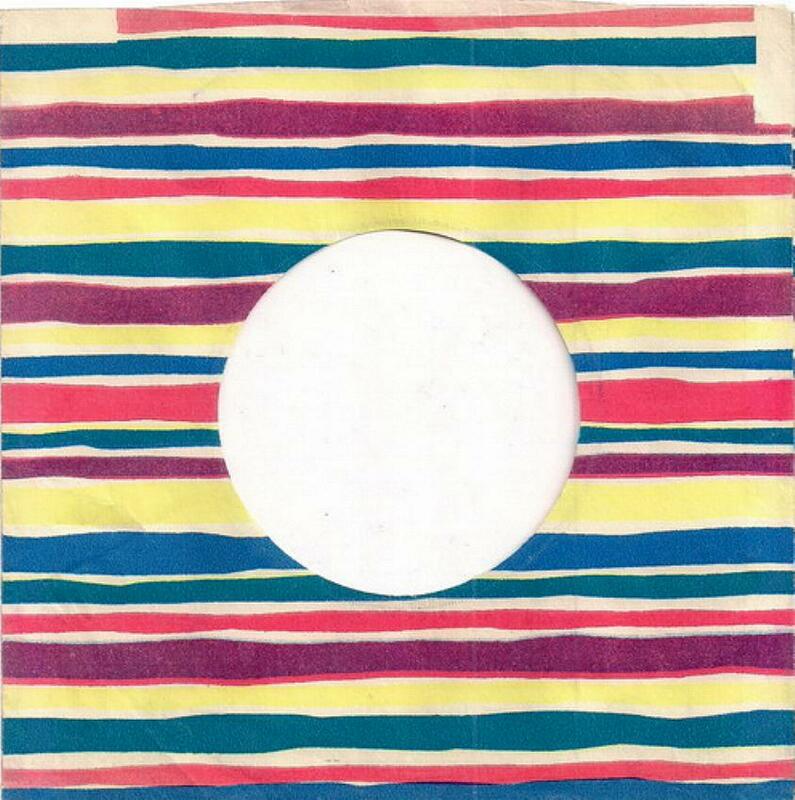 EMI introduced their record tokens on this sleeve and the price was 6/- to 50/-. 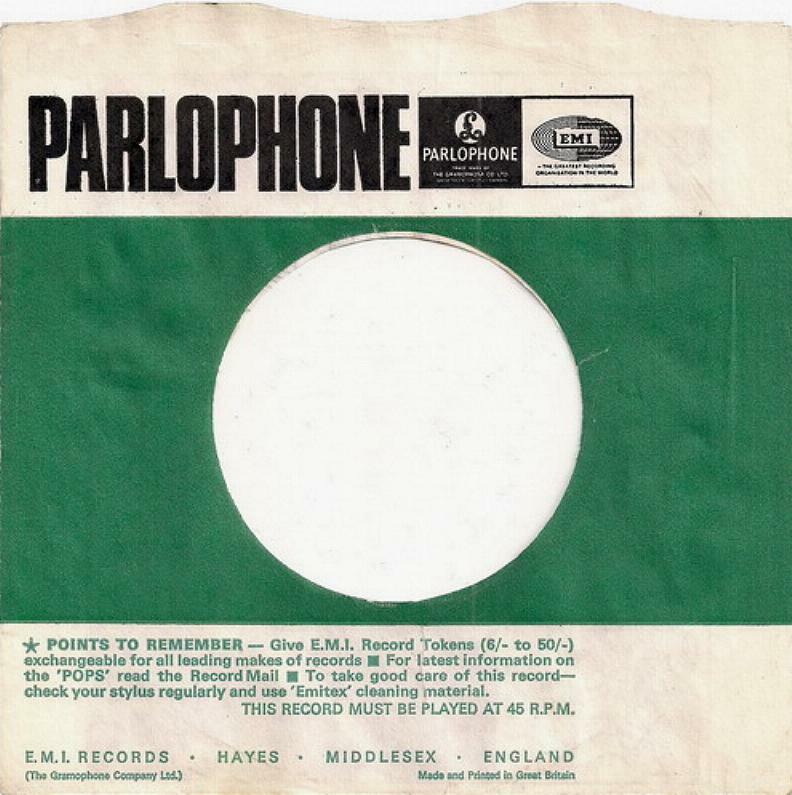 Used from January 1963 to summer 1964 with Parlophone series R 4989 – R 5222 including The Beatles singles R 5015 “From Me To You”, R 5055 “She Loves You”, R 5084 “I Want To Hold Your Hand”, R 5114 “Can’t Buy Me Love”, R 5160 “A Hard Day’s Night” and R 5200 “I Feel Fine”. Type 4 sleeve. Dark green sleeve with white print and wave top. 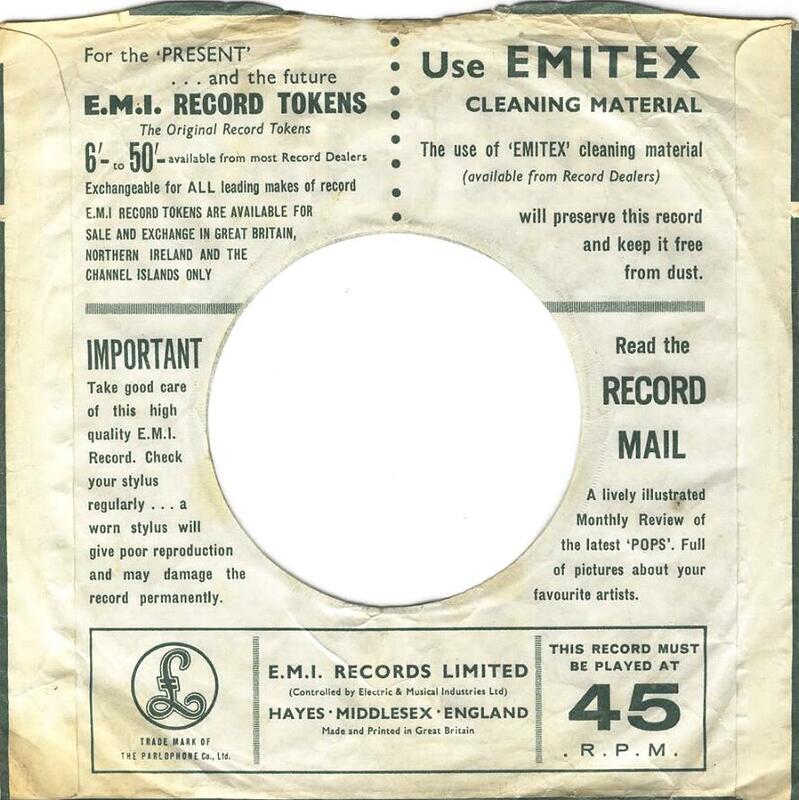 The price for the EMI record tokens was 6/- to 50/- on the sleeve. Used from summer 1964 until November 1964 with Parlophone series R 5103 – R 5222 including The Beatles singles R 5114 “Can’t Buy Me Love”, R 5160 “A Hard Day’s Night” and R 5200 “I Feel Fine”. Type 5 sleeve. 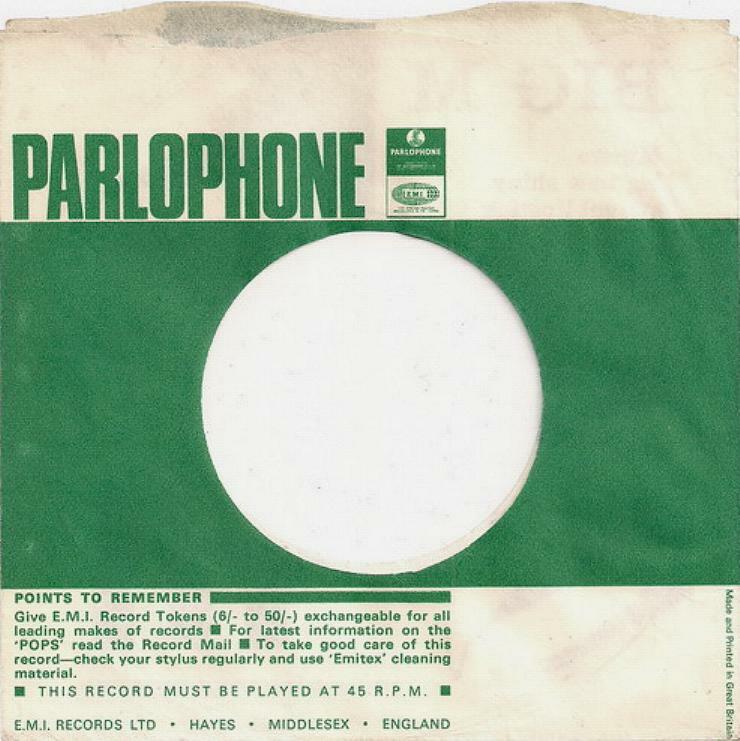 Green sleeve with Parlophone and globe EMI logo. 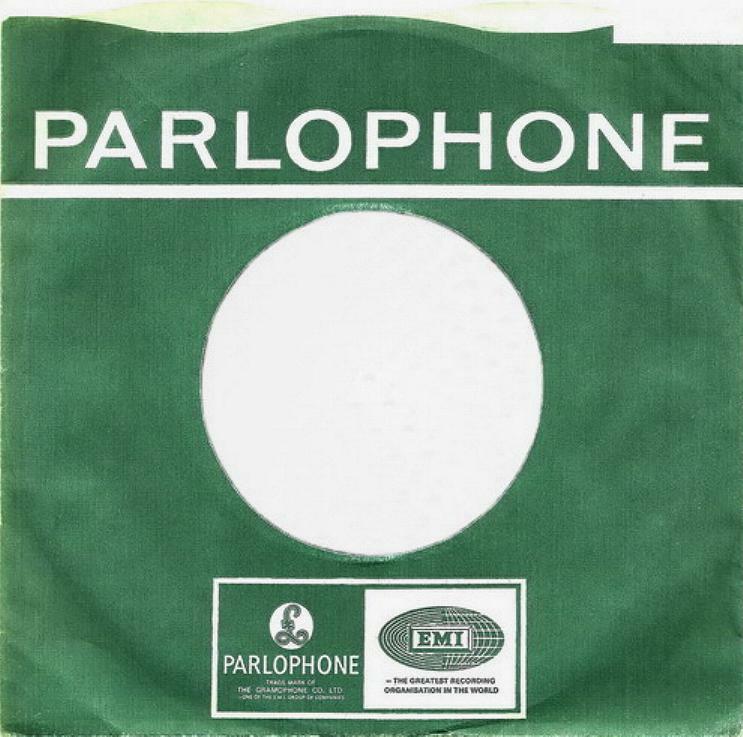 The copyright text below the logos is “THE PARLOPHONE CO. LTD”. 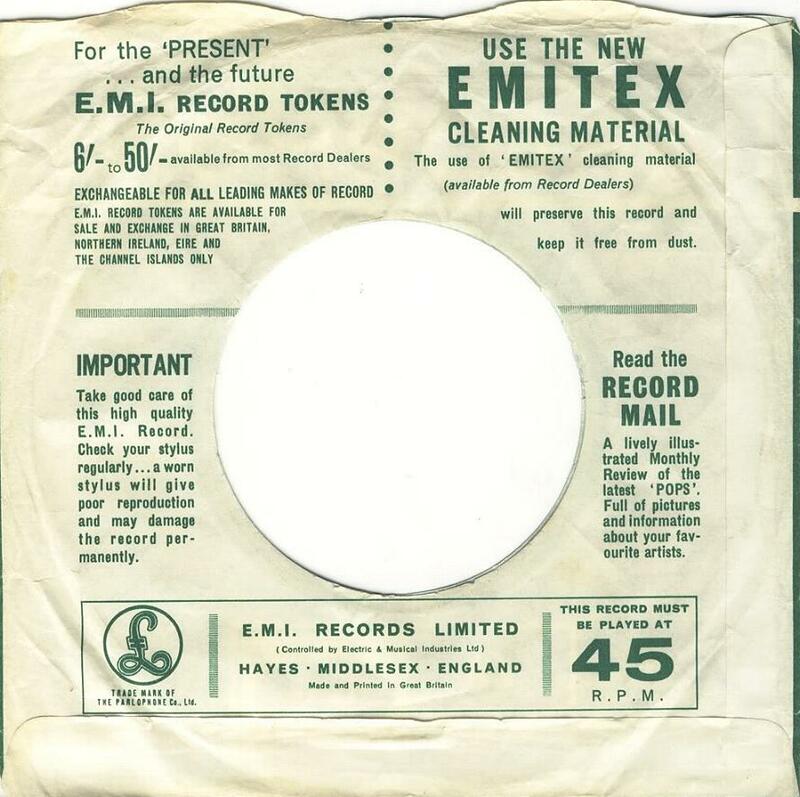 The price for the EMI record tokens was 6/- to 50/- on the sleeve. 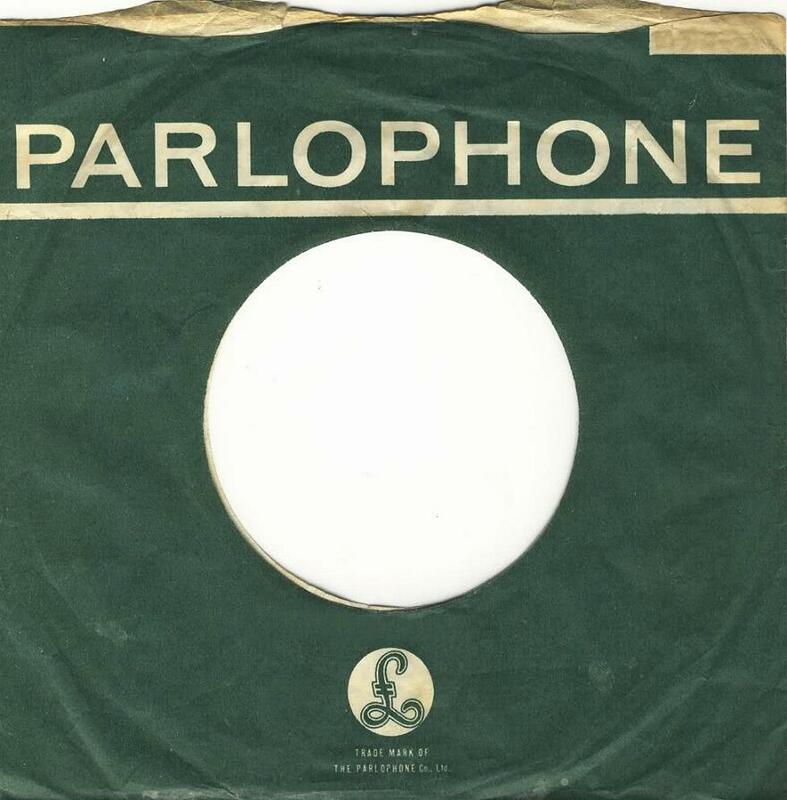 Used from November 1964 until autumn 1965 with Parlophone series R 5103 – R 5389 including The Beatles singles R 5200 “I Feel Fine”, R 5265 “Ticket To Ride” and R 5305 “Help!”. Type 6 sleeve. Green sleeve with Parlophone and globe EMI logo. The copyright text below the logos is “THE GRAMOPHONE CO. LTD”. 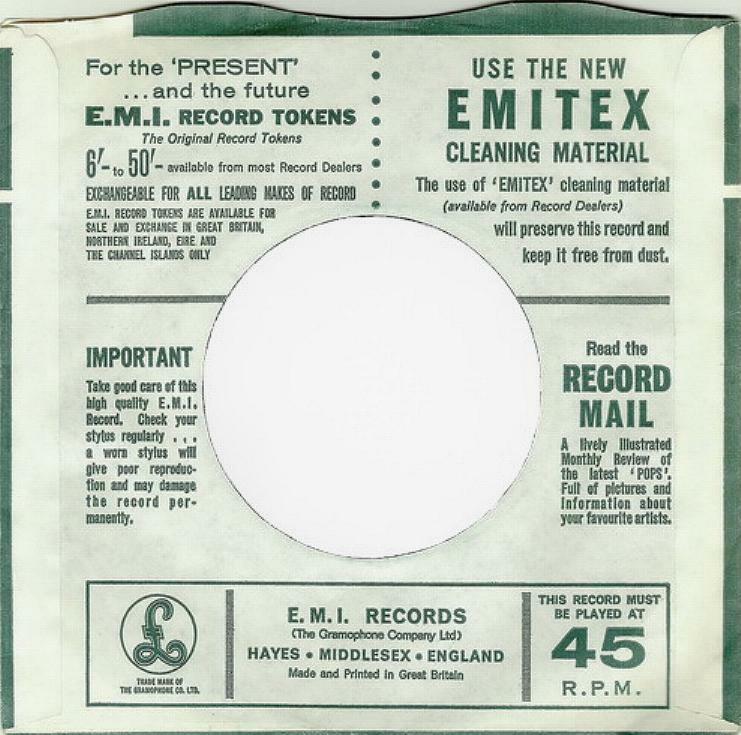 The price for the EMI record tokens was 6/- to 50/- on the sleeve. 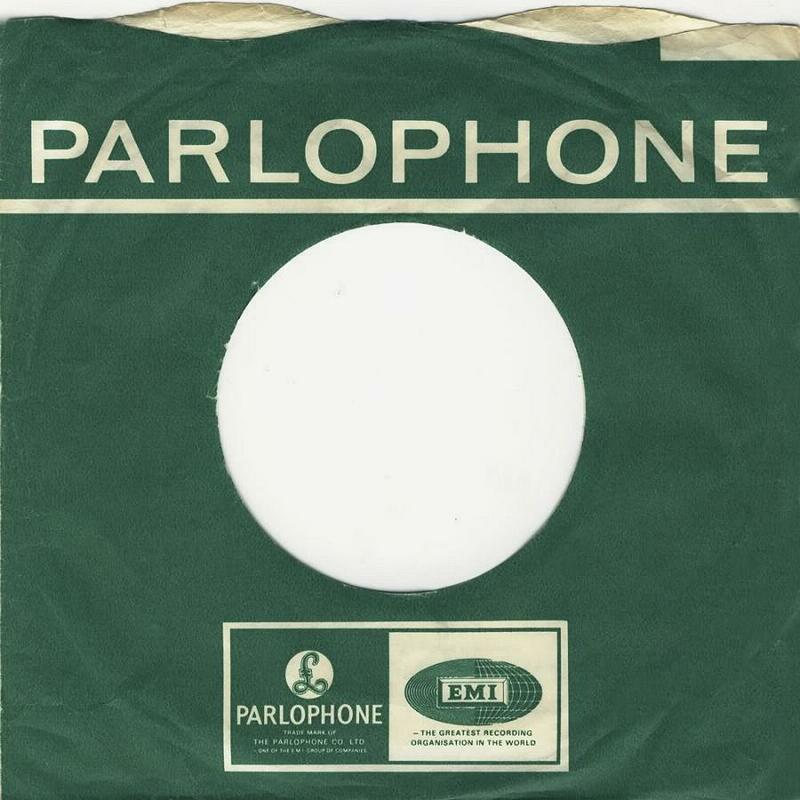 Used from autumn 1965 until late 1965 with Parlophone series R 5225 – R 5788 including The Beatles single R 5389 “We Can Work It Out”. Type 7 sleeve. 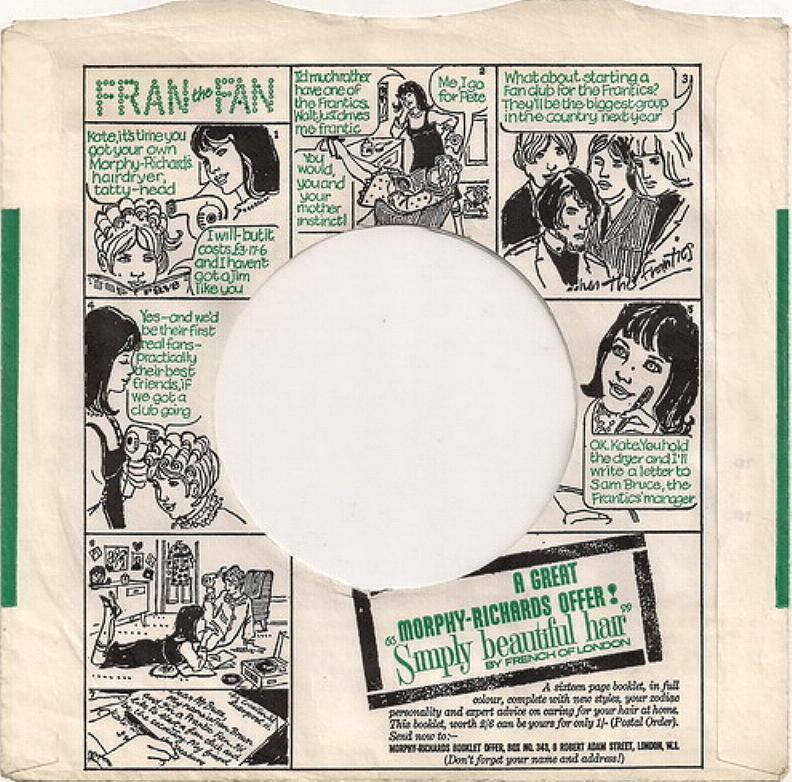 Green sleeve with black Parlophone logo and “Fran The Fan” advertisement on the back. 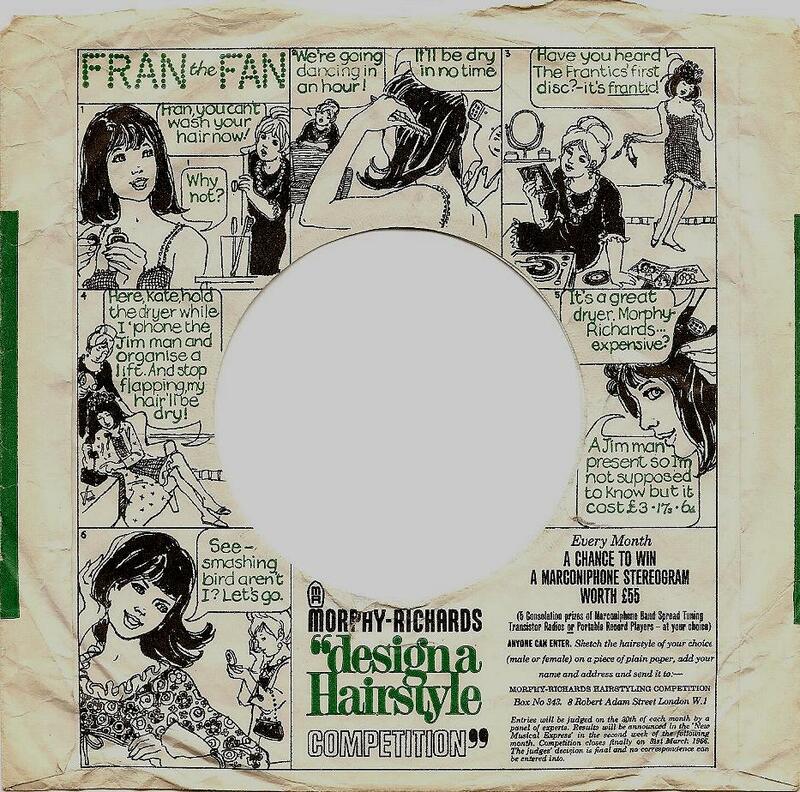 Three different “Fran The Fan” cartoons in green and black advertise Morphy-Richards hair products on the back of the sleeves. 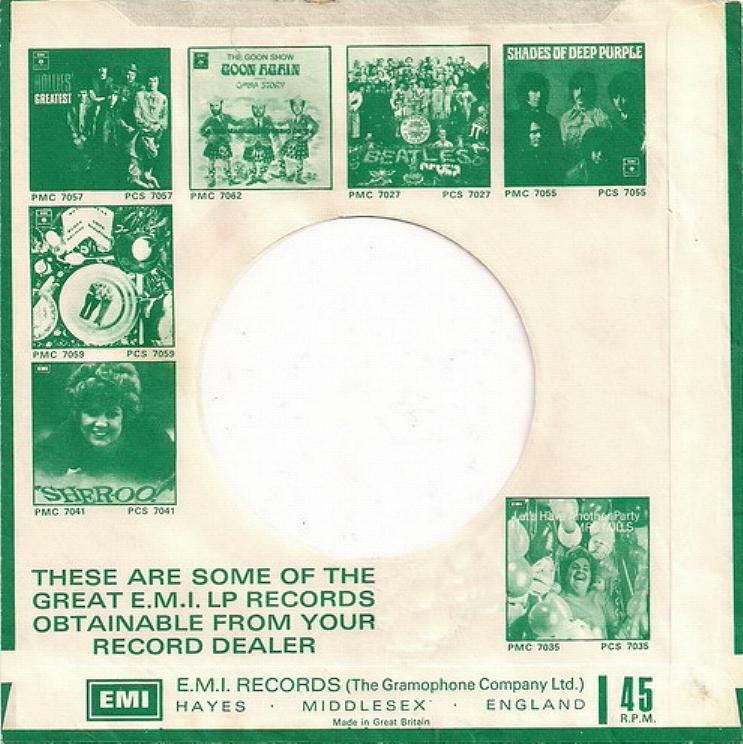 The price for the EMI record tokens was 6/- to 50/- on the sleeve. 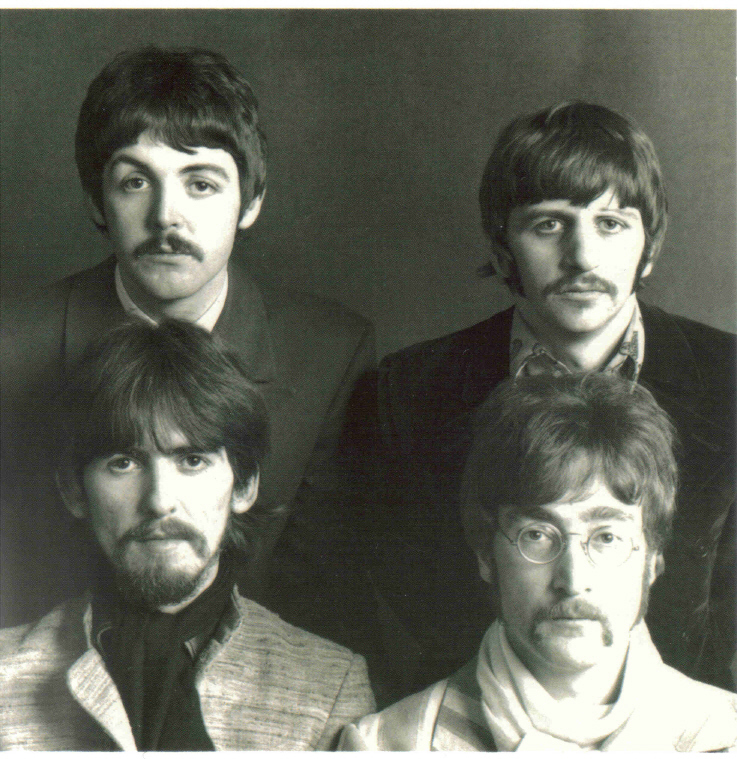 Used from late 1965 until 1968 with Parlophone series R 5225 – R 5788 including The Beatles singles R 5389 “We Can Work It Out”, R 5452 “Paperback Writer”, R 5493 “Eleanor Rigby”, R 5620 “All You Need Is Love”, R 5655 “Hello Goodbye” and R 5675 “Lady Madonna”. Type 8 sleeve. 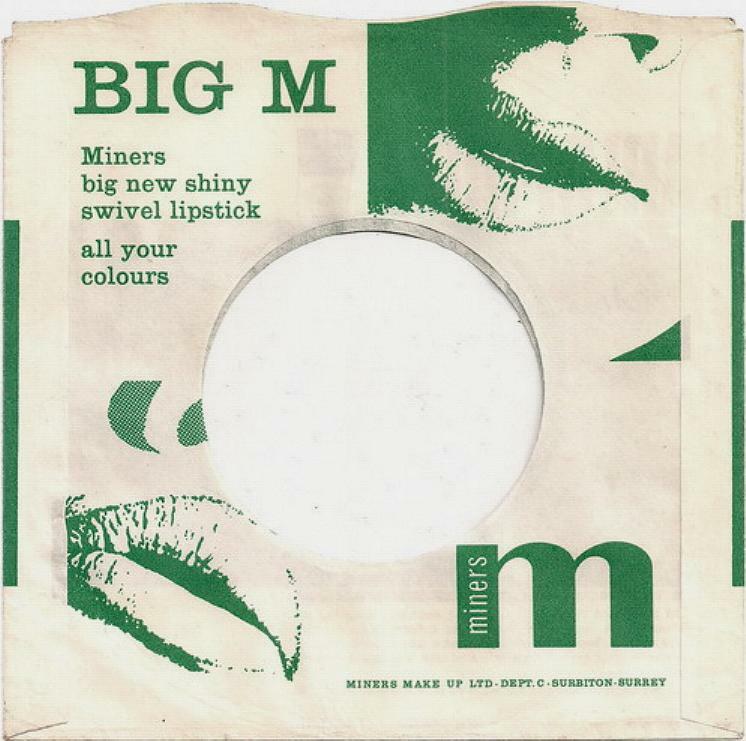 Green sleeve with green Parlophone logo on the front and “Miners” advertisement on the back. 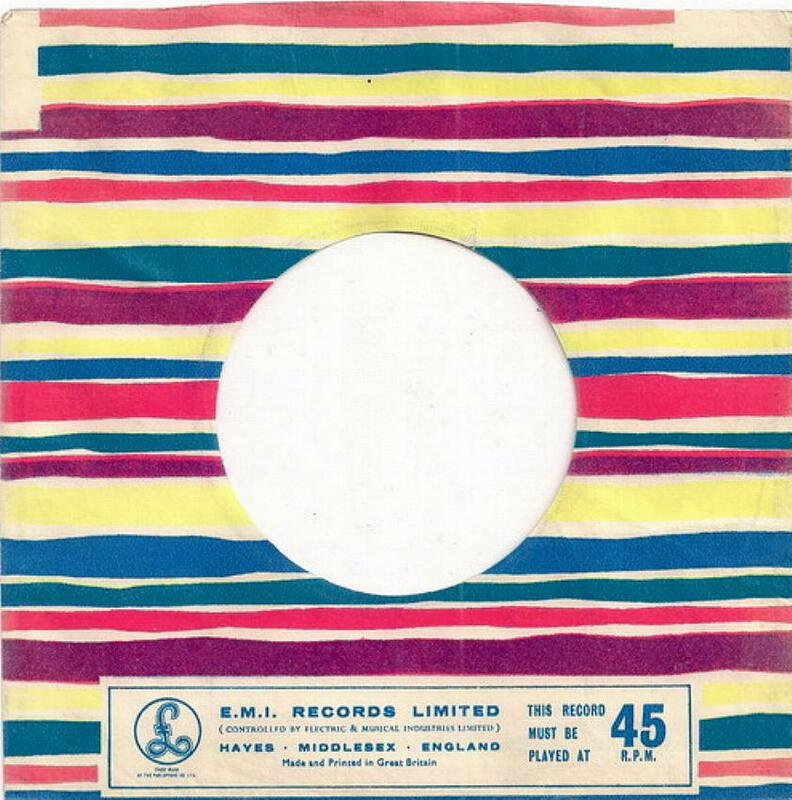 The price for the EMI record tokens was 6/- to 50/- on the sleeve. 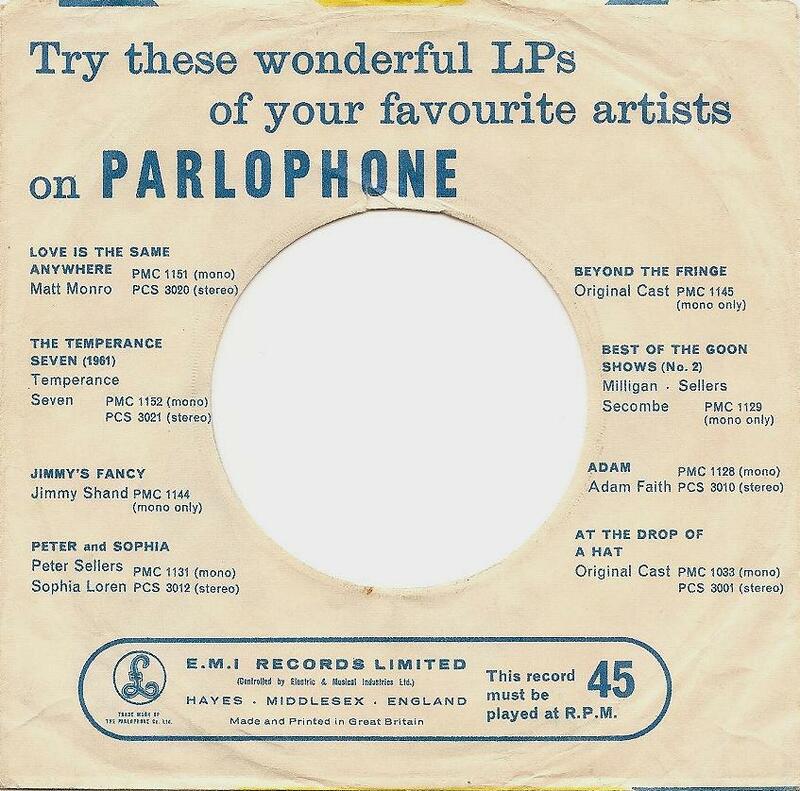 Used from late 1965 until 1968 with Parlophone series R 5225 – R 5788 including The Beatles singles R 5452 “Paperback Writer”, R 5493 “Eleanor Rigby”, R 5620 “All You Need Is Love”, R 5655 “Hello Goodbye” and R 5675 “Lady Madonna”. Type 9 sleeve. 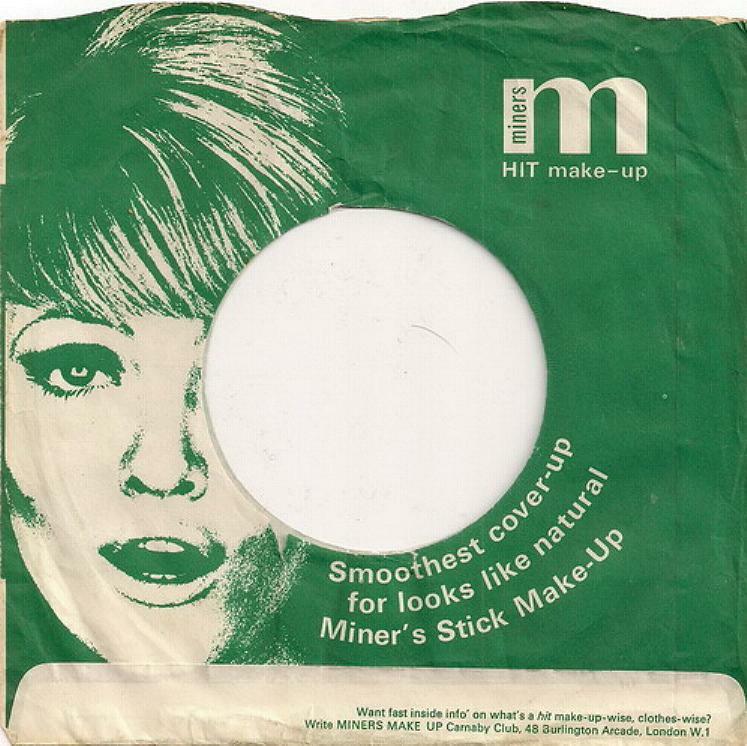 Green sleeve with green Parlophone logo on the front and “Miners” advertisement on the back. 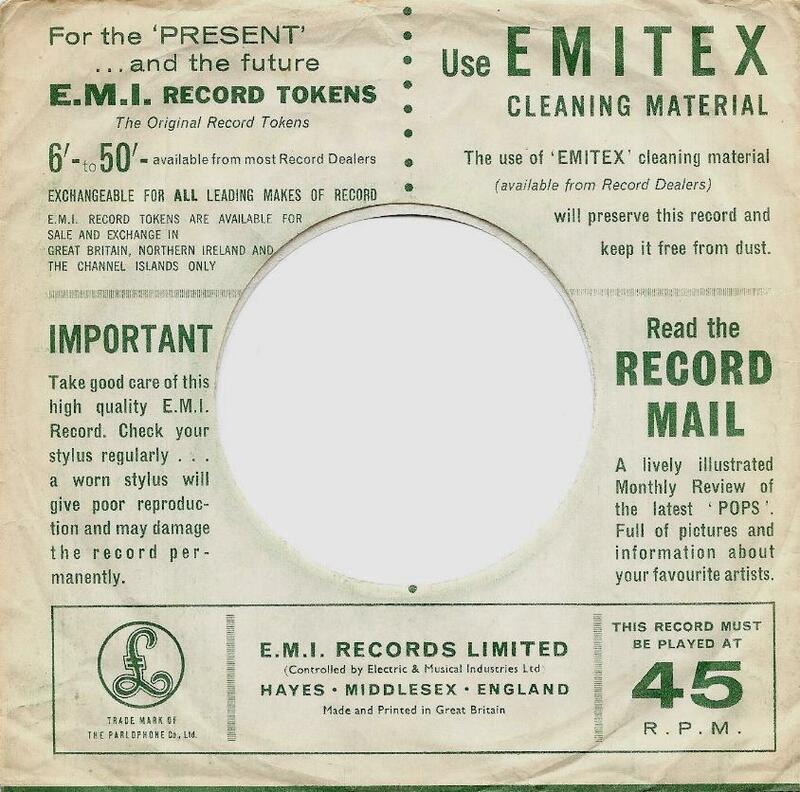 The price for the EMI record tokens was 7/3 to 50/- on the sleeve. Used from 1966 until 1968 with Parlophone series R 5357 – R 5788 including The Beatles singles R 5452 “Paperback Writer”, R 5493 “Eleanor Rigby”, R 5620 “All You Need Is Love”, R 5655 “Hello Goodbye” and R 5675 “Lady Madonna”. Type 10 sleeve. 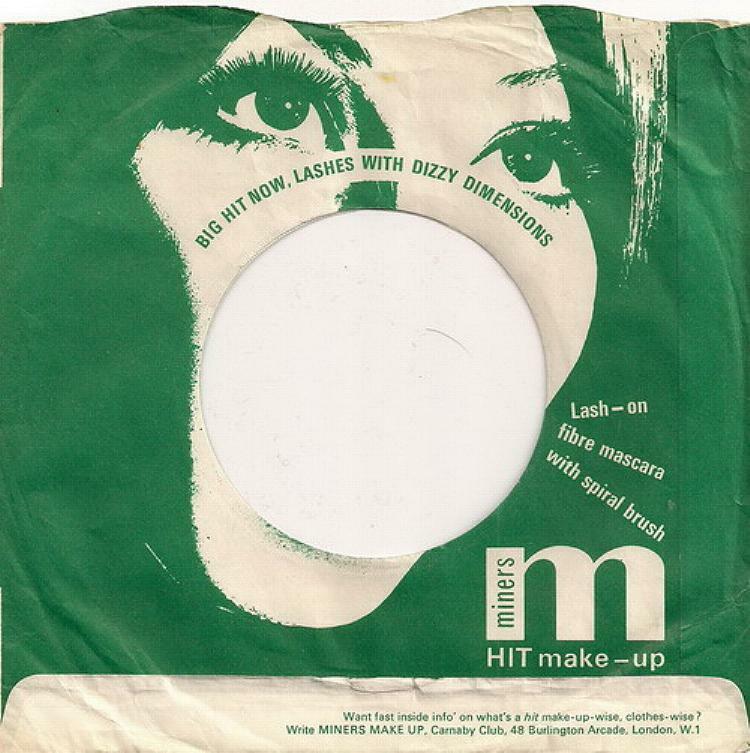 Green sleeve with green Parlophone logo on the front and “Miners” advertisement on the back. 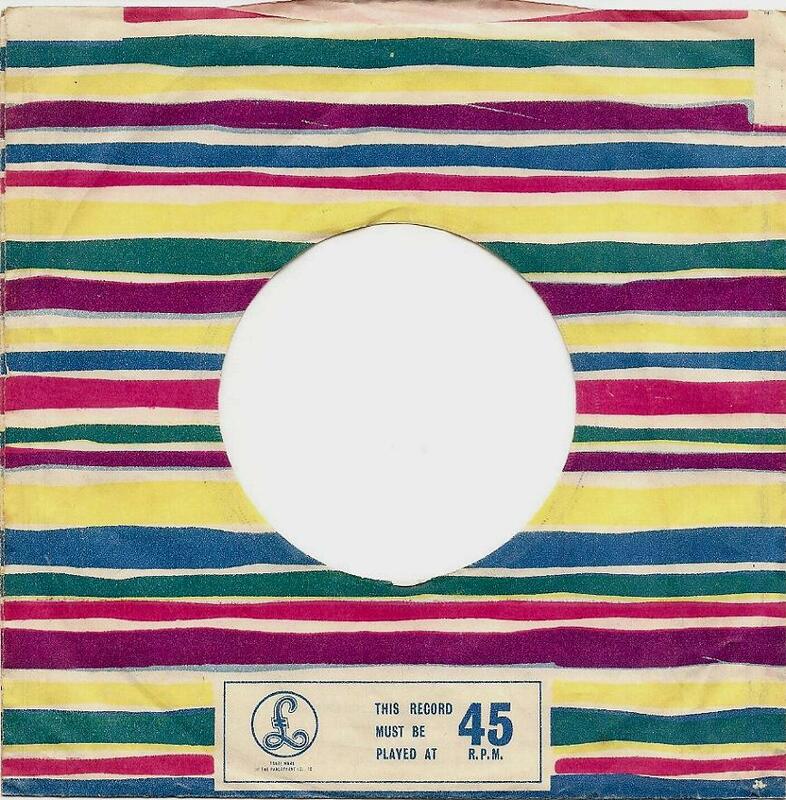 The price for the EMI record tokens was 7/3 to 50/- on the sleeve. 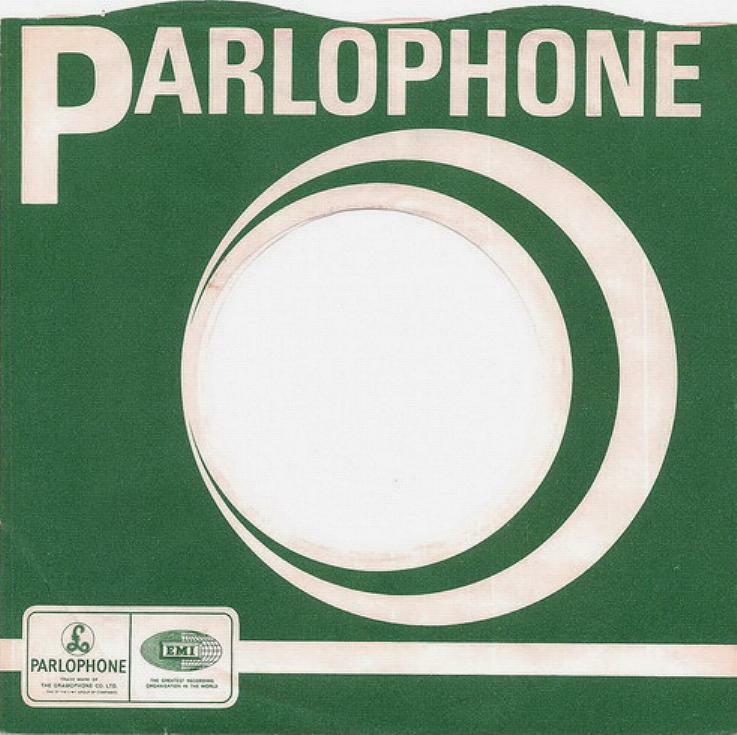 Used from 1966 until 1968 with Parlophone series R 5357 – R 5788 including The Beatles singles R 5452 “Paperback Writer”, R 5493 “Eleanor Rigby”, R 5620 “All You Need Is Love”, R 5655 “Hello Goodbye” and R 5675 “Lady Madonna”. Type 11 sleeve. 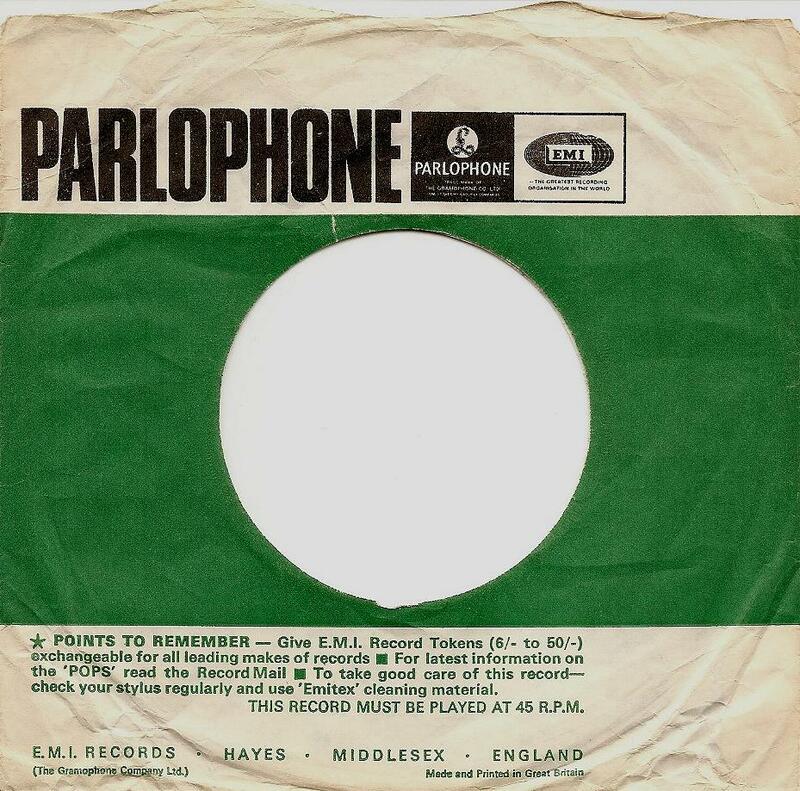 Green sleeve with Parlophone and globe EMI logo. 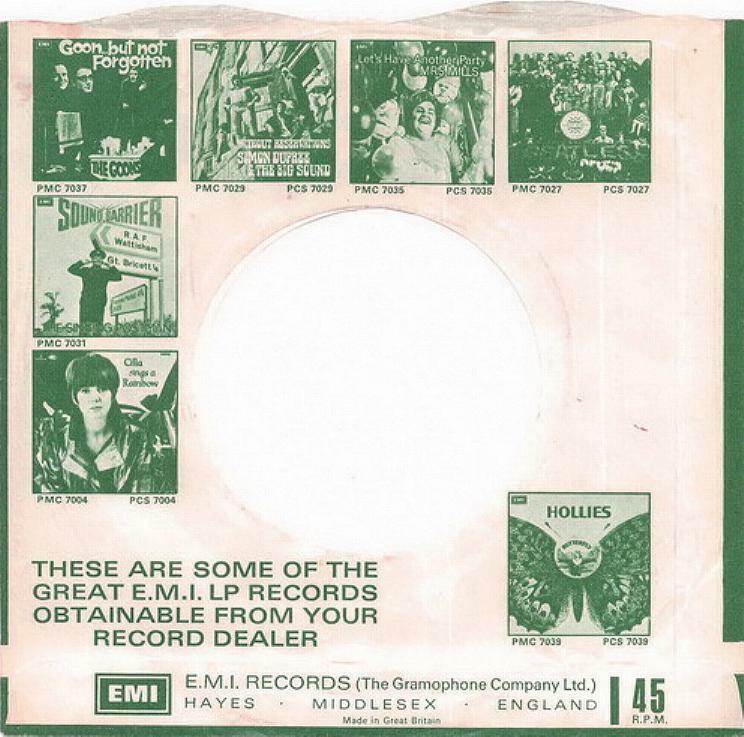 The copyright text below the logos is “THE GRAMOPHONE CO. LTD”. 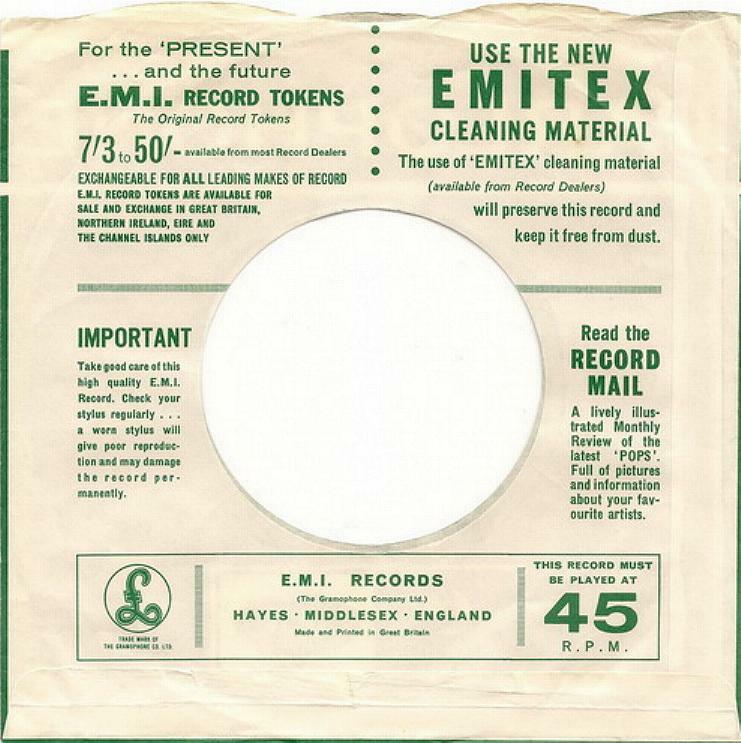 The price for the EMI record tokens was 7/3- to 50/- on the sleeve. Used from 1966 until 1968 with Parlophone series R 5357 – R 5788 including The Beatles singles R 5452 “Paperback Writer”, R 5493 “Eleanor Rigby”, R 5620 “All You Need Is Love”, R 5655 “Hello Goodbye” and R 5675 “Lady Madonna”. Type 12 sleeve. 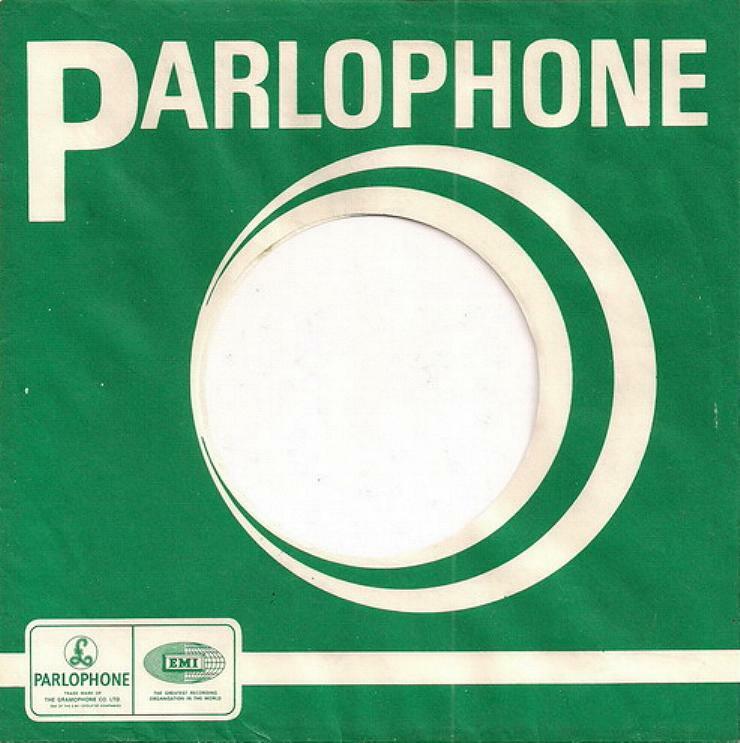 Green sleeve with Parlophone and swirl. 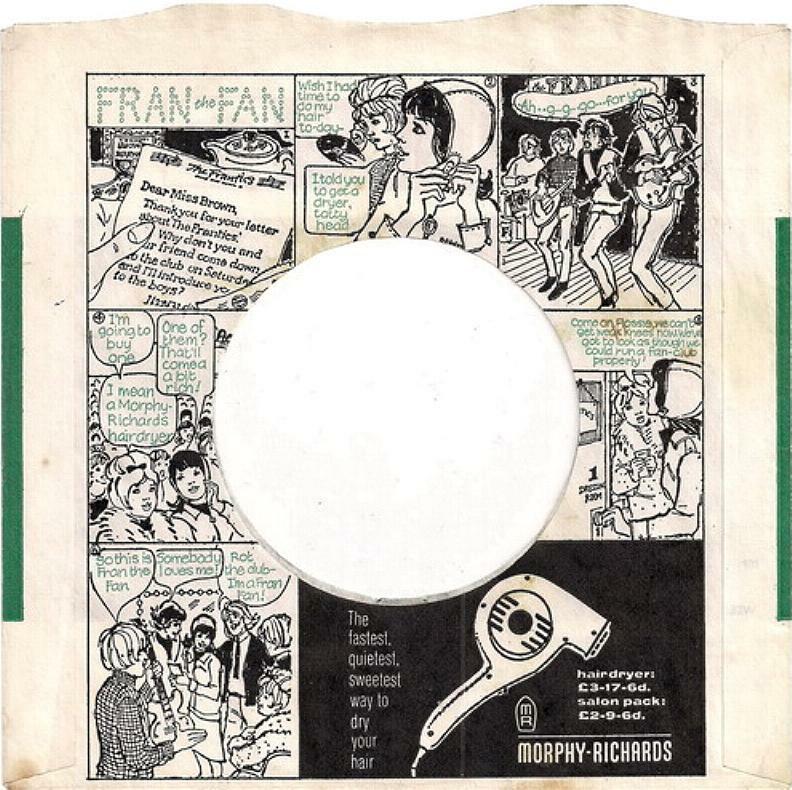 These were at least two different backsides used this sleeve design, advertising different LPs. 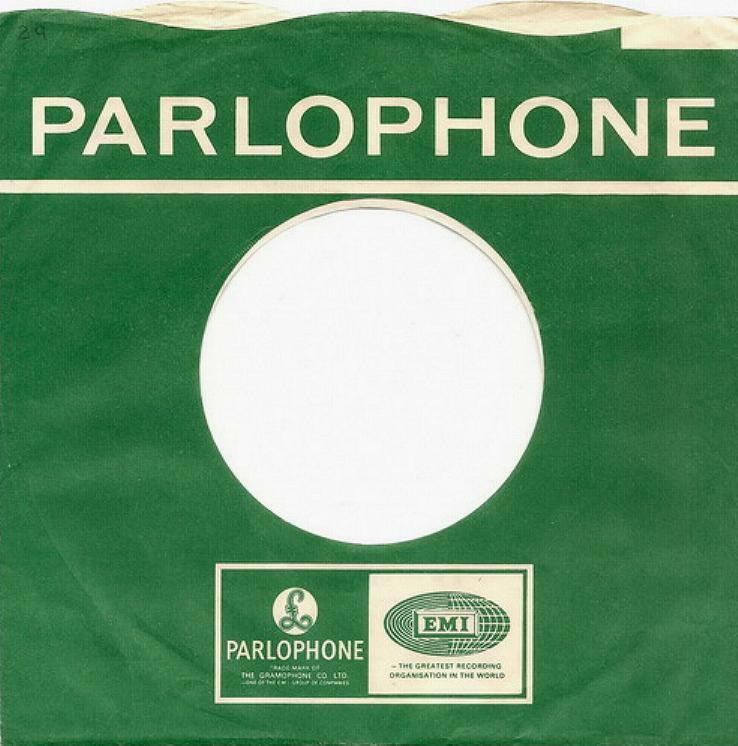 Used from 1968 with Parlophone series R 5357 – R 5931 including The Beatles singles re-issued 1969.